At the beginning of its development, SPA web platforms lacked a flexible but simple system for creating the projects that could amend and, in some cases, replace both mobile and desktop apps. At that time, a user whose problem was quite simple had to find an application capable of solving the problem. In the course of time, the technologies kept moving forward making web services gain popularity since the latter had no need to be installed. What was needed is just to visit a website for accessing one or another service. Previously, such tasks could be solved through websites written in either ActionScript or Java. However, those systems required to install either Flash or Java being at the same time far from the speed expected by the users. In order to look into the reasons for the popularity of both Angular and React, the detailed statistics is worth considering. The team page of Angular contains 36 developers while React has no team page at all. The popular web resource GitHub dedicated to open source projects represents 40 490 ranking stars along with 1 714 contributors for Angular. In its turn, React has 110 961 stars and 1 200 contributors respectively. The chart below represents the stats for the ranking stars belonging to both Angular and React. As we can see, React has much more stars than Angular, and the gap is growing continuously. Another stats is provided by the package manager npm which offers the number of downloads for both Angular and React. Again we see how actively React outperforms Angular also in downloads. And the last chart we’d like you to check is Google Trends detecting popularity on the basis of the number of requests available in the Google search system. The situation is a little bit different here. At first, Angular was more popular in search, but later the trend has reversed. 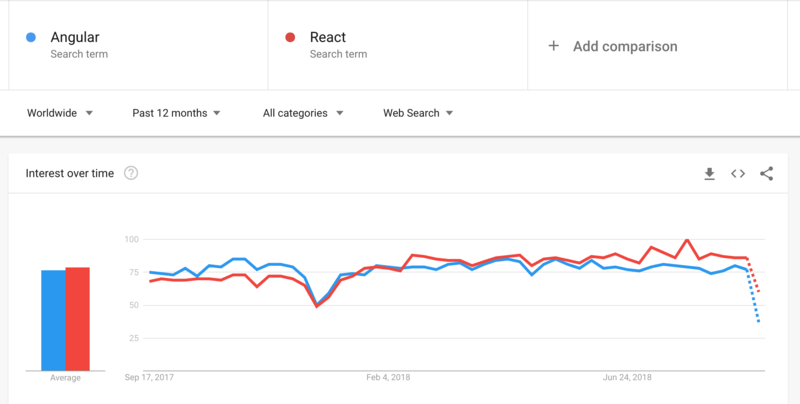 According to the latest data, React is at the top of searches now while Angular is following closely nevertheless. We may not ignore a popular resource StackOverflow which conducted a survey on who prefers what with regard to Angular and React. AngularJS (the Angular 2 version was beyond the survey, unfortunately) gained 52% of votes while React reached 67%. In response to the question about the lack of interest to further development, the framework by Google gained 48% of votes while its competitor reached only 33%. The important question about an intent to use the framework again later represented React with 92% of votes while Angular reached only 65%. Basing on the aforementioned data we can come to a conclusion that React is more popular among developers than Angular. In any case both React and Angular together are occupying 100% of popularity on the market that implies their leadership for a long time. In order to examine two different systems in the most objective manner, we need to check their main differences first. This time, we will consider only “out-of-the-box” versions. However, everyone can couple JSX with Angular as well as TypeScript with React. It is clearly obvious that a developer made a bug since instead of string s/he delivered boolean. Therefore, a bug is created without being traced that can lead to an error which another developer could make since the error was not identified immediately. We determined the type of data expected for the arguments of a function along with what is to be returned. We immediately found an error in a code after compilation. That was one of the simple cases that reveal the quality of a project. Besides, it shows what a time-consuming search for errors takes place while TypeScript rejects them by banning the very compilation. The developers of programming languages strive to separate View from code in order to facilitate sharing of a project. Facebook, on the other hand, believed that keeping everything together was a more proper approach to componential development. The React proponents have an ambivalent vision of such an approach. Some of them are trying to limit JSX to minimum. The other developers actively use JSX having no idea why to reject it. The syntax allows to develop and add components in a simple manner facing, nevertheless, some insignificant problems with both the HTML template development and further integration to React. A more or less correct solution in case of a React-based project comes to an immediate integration of a design into React components. In a similar case, Angular follows a more traditional approach when logic is separated from View. Once the Angular solution is based on Two-way data binding as well as on its own template engine, we can easily integrate an HTML template into View for Angular components. Even though the syntax of the Angular template engine has its own pros and cons, it does make integration dynamics into View in a simple manner. It allows adding Model for using such components in the other components that, therefore, lead to the creation of sophisticated SPA systems. In the given example a component displays “Hello world” in the midst of its View. It is simpler when working with React: one file is enough to create a new component. Each system has a different approach to the creation of components having its own pros and cons. And each developer is to decide which approach is more relevant for the project development. Once React is the library which has no powerful out-of-the-box solutions, the developers have to find the modules they need on their own. On the other hand, the Angular developers face a set of solutions they cannot refuse from the very beginning. Every single one of the approaches does not imply the best solution. The React developers have to check the compatibility with the latest React version when many new libraries are to be involved. They have to do updates manually. Many libraries are created not by Facebook. That’s why the developers have to hope that the creators of their favorite library will update its compatibility with a new React version in time. The Angular developers have fewer concerns since the majority of tools are created by Google and, therefore, they are updated in parallel with a new version of Angular. Of course, the developers use the third-party libraries for one or another task, but the number of such libraries is significantly below the number React offers. Besides, fewer of them are important for a correct operation of a system. Modules for Animation, Localization etc. A spectrum of the Angular tools is increasing continuously to support more and more solutions that allow reducing the need in the third-party libraries in the future to use Angular out of the box at full capacity. Once Angular is a framework, its size is significantly bigger than the size of a lightweight React. In terms of size, Angular is inferior to its competitor. However, some extra megabytes can hardly play a crucial role in the contemporary world. What is really important for the developers are both the performance and speed providing a pleasant work with a system. 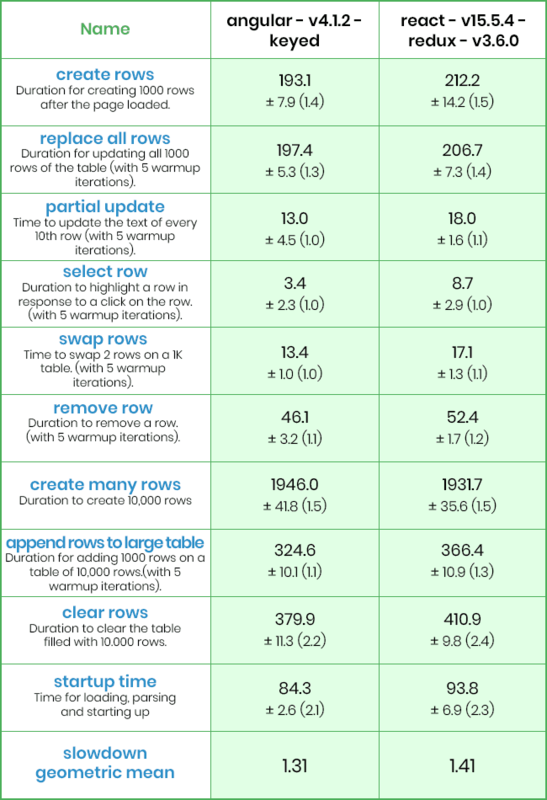 The following is a benchmark comparison of both Angular and React. 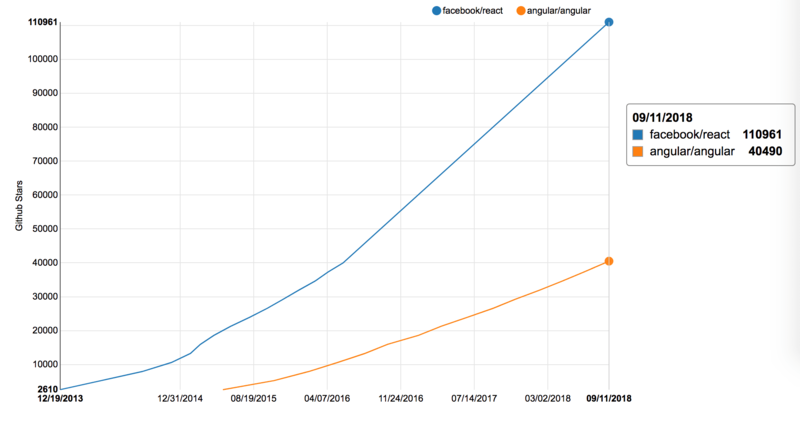 As the stats show, Angular works a little faster than React does. Angular 6 has a better performance than Angular 4 has, but even the previous version beats its competitor. Of course, the difference is not too huge, but Angular can provide a better performance when a sophisticated system is under development. After all, the developers should figure out which system is more relevant for their tasks on their own. Both universal and native solutions are actively implemented in various types of applications such as web, mobile and desktop. Both React and Angular offer supporting native solutions. Angular has NativeScript (under support of Telerik) for native solutions along with the Ionic framework for developing hybrid apps. React offers react-native-render for the development of cross-platform solutions as well as React Native for native apps. Both variants are in the equally active use having almost no difference for an average user in operation. The solutions allow reducing labor when a system having both web and native apps is created. The hybrid solutions can offer neither a high speed nor stability in operation, unfortunately. But for simple tasks they are sufficient. It’s quite explainable that mastering of Angular implies a more difficult learning process. The documentation is ample and difficult to learn that requires significantly more time for training. Besides, learning of TypeScript is to be added to the process that makes the developers doubt whether the Angular theory is worth their time. Both systems offer their specific approaches to the development. One way or another, but the developers have to decide what is more important for them. It is necessary to realize that both Angular and React imply different methods the developers have to follow when they choose one or another system to work. Both Angular and React are great systems for executing various tasks in the web project development. Angular is better suited to the developers who would like to have everything necessary out of the box thinking about neither manual updates nor third-party libraries. React, in its turn, allows configuring a project in a more flexible manner according to its objectives. Both solutions have their specific pros and cons. And understanding of them should be taken into consideration when a final decision on what to choose is to be made. The end users can hardly distinguish one approach from another if both ones are developed in a correct and high-quality manner. A developer who has a working experience with TypeScript will most probably choose Angular as a basic framework. The one who prefers to control a number of libraries inside a project will opt for React. No fully universal solution is available - the choice is up to you in accordance with the project objectives you chase.